Did you know the use of home-based monitors connected to healthcare data centers can reduce mortality in cardiac implant patients by 50%? Or that CardioComm’s telehealth products have been shown to reduce inpatient admission by 20% for those with multiple chronic conditions? Or that a platform called The Wound Technology Network can help to lower the $33 billion cost of treating diabetic ulcers by 70%? The medical health revolution is here, thanks in large part to a few notable digital devices like the iPad. 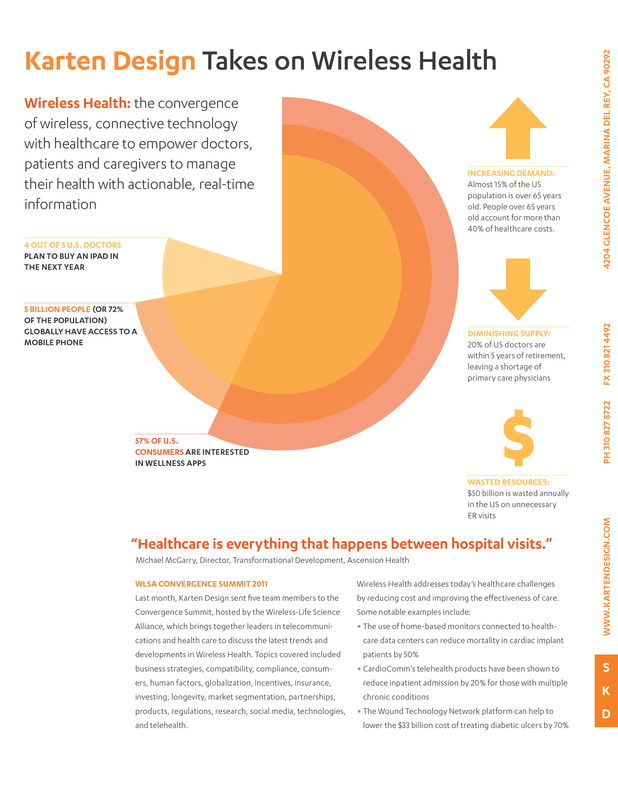 Stuart Karten Design, a Los Angeles based design and innovation consultancy, put together this infographic on wireless health, including mobile technology, medical and healthcare. Data from the infographic is based on information gathered at the recent WLSA 6th Annual Convergence Summit in San Diego.